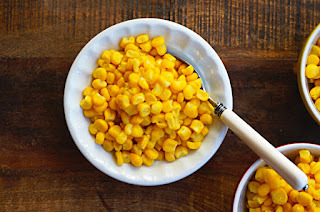 These are Butter Corn Kernels or also known as Corn In A Cup is a popular snack in Malaysia. You can find them all over the mall and at many night markets. They are delicious, buttery and slightly salty. Place frozen corn kernel in a pot, add enough boiling water to cover the corn. Turn on the heat to high and bring it back to a boil. Then reduce the heat and simmer for about 2 to 3 minutes. Remove the pot and drain the corn kernel in a colander. Return the corn kernel to the pot. Turn on the heat to low. Add butter and salt. Stir until the butter has melted. Serve warm.